or a signed and inscripted Joy of Tech Book! 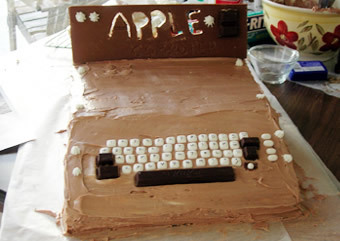 Adventures of the "Homebake Club"
Re-creating the Smithsonian Apple I, ... in cake! Part 2! Prepare your work surface. We used a piece of wooden board so that we could move it around for decorating ease, (it also mimics the Smithsonian display's desk), putting wax paper on top of the board, which we later trimmed away. Stack two of the cakes on top of each other with the bottom up on the top cake. 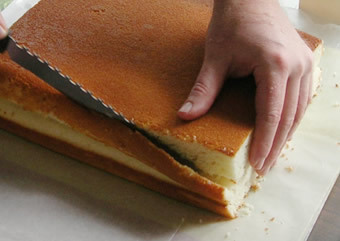 Carefully trim off the sides to make the edges of the cake flush. 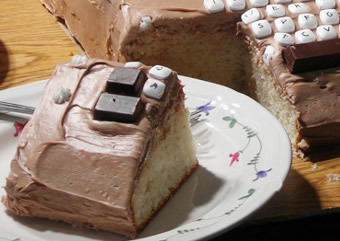 If you like, you can put icing in between the cake layers. Although it looks more impressive in the final slices, we opted to not ice between the cake, so as to insure we had enough icing for the outside, and to save a few calories. Place the other two cakes next to the first two, and trim those edges. Again the bottom of the top cake should be facing up. Save a couple of these cake strips, as you'll be needing them to help you attach the chocolate bar backboard later. 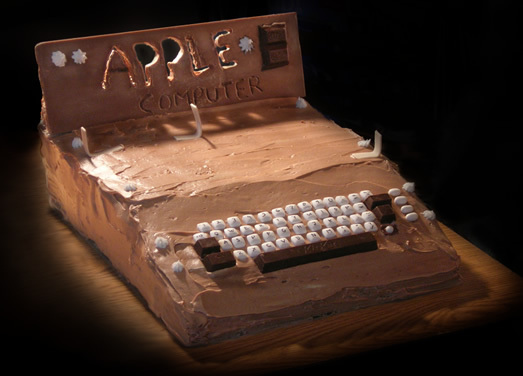 Angle off the top cake at the appropriate angle for the Apple I's slanting face, where the keys will sit. Step #5: The Icing on the Cake! In a bowl, combine the vanilla icing with a few tablespoons of chocolate icing, and gently mix them together with a large spoon. You are aiming for a slight woodgrain effect, not a perfectly blended color. Once you think you have a nice blend, blob on the icing and spread it around as evenly as you can, go with a side to side motion to emulate the wood paneling. 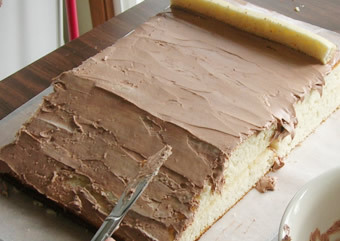 Try not to work it too much, especially over areas that have been sliced, or you'll get crumbs in the icing. Ice the back and sides of the cake too. Step #6: Decorating the cake! We were wondering what could we use for the keyboard keys? We had thought about using sugar cubes, but they proved too large for the scale of our project. During a shopping spree to get more baking products, I scanned the candy bar racks for inspiration. There I spied what I needed... Dentyne Ice Mints! Carefully place the Dentyne Mints on the slant of the cake. 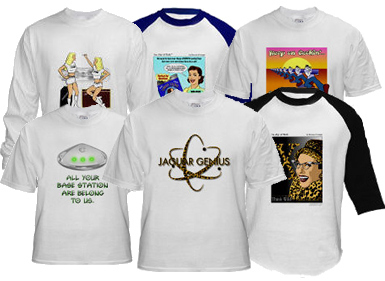 Don't just randomly put them on, make sure they accurately reflect the original computer's keys, as there will no doubt be some geek at your party who will want to try programing with the Apple I cake. 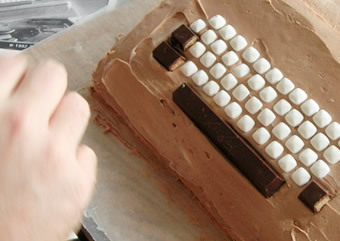 We used a section of a KitKat bar for the space bar, and used small cut pieces of the bar for the other keys. We couldn't find an appropriate grey colored candy for the grey keys on the right hand side of the cake, so we used Tic Tac mints. Time to attach that chocolate bar backboard! Place one of those strips of cake on the back part of the cake to help support the bar. Carefully trim the bar to fit the width of the cake, then place the bar on top of the cake and secure with copious blobs of icing. It's now time to admire your artistic masterpiece! Voila! You've built your very own edible Apple I! To finish off our project, we needed to photograph our creation. We tried to re-create the lighting and atmosphere of the Smithsonian photograph, using a back spotlight to illuminate the cut-out letters and generate the lighting patterns on the top of the case. 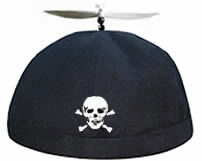 Although it's not perfect, we were very pleased at the end results! 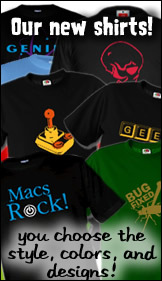 And in case you haven't seen it yet, check out the finished Joy of Tech comic featuring the Apple I cake. There comes a time in every cake's life where it must be eaten. Although it may seem sad to destroy the creation you've lovingly labored over, don't despair. 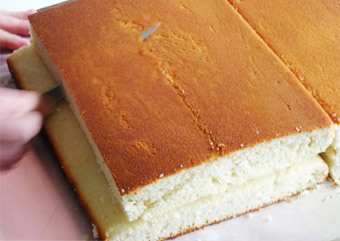 This is a natural part of a cake's product cycle, and in fact, the cake would not be complete without you eating it. 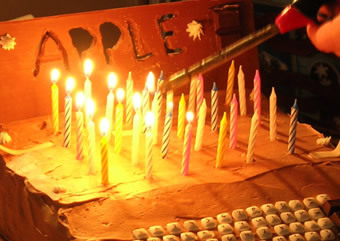 When the moment is right, place 30 candles on your Apple I and light them. 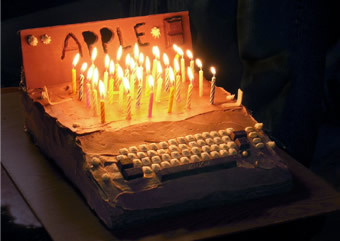 Sing "Happy Birthday" to Apple, make a wish for new hardware soon, then blow them out. Slice that baby up and enjoy! Don't forget to take pictures of it!